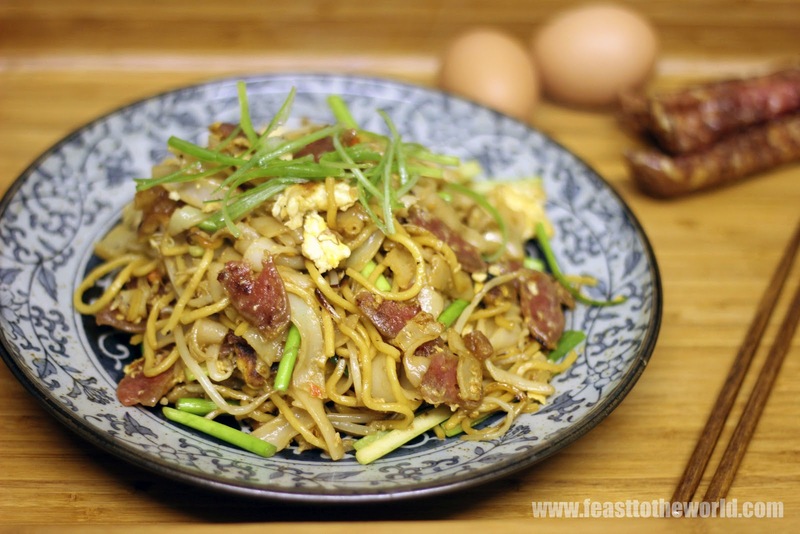 One of the most popular Singapore hawker street food of all time is undoubtedly Char Kway Teow. I love Char Kway Teow and it was one of those dishes that I used to eat way too often when I was back in Singapore and without a doubt the dish that I craved the most. Many of my wasted youth were spent lurking in a Hawker centre leering over these glass window, trying to spy on the ah peh (unkle) stir frying this dish from scratch. 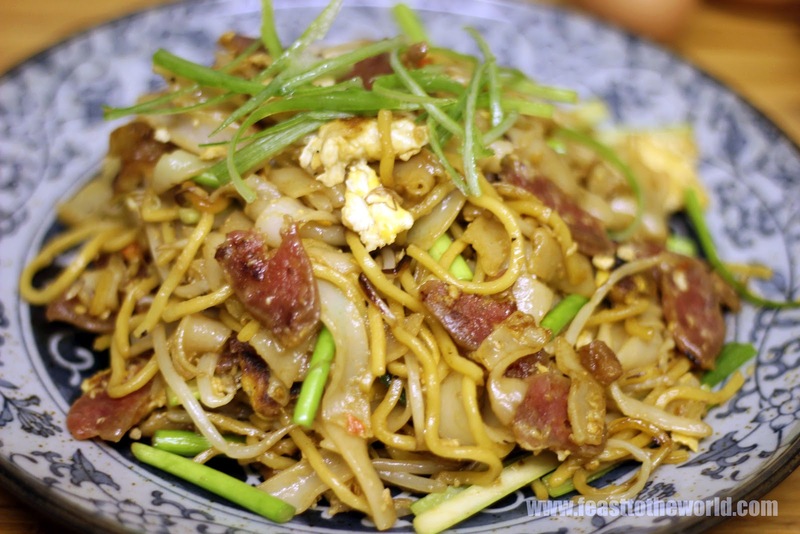 Most hawker vendors have been cooking the same noodle dish for years and therefore it often seem like as if they are waltzing around with their massive wok as they graceful glide the spatula around the wok, tossing and turning every ingredient. Scoop of different seasonings were added every so often with such familiarity that no measurement was needed, everything was agar agar (estimation in Singlish - Singapore English). And then to top it all off, the notorious see hum (cockles) along with it's bloody juices were added to complete the dish. The adjective 'bloody' might send fear to most but to a true aficionado, a CKT is not CKT without it. Another must have ingredient, once again, not for the squeamish or should I say health conscious is pieces of crispy pork lard. 'Yeeeeeow!' you might say but this contribute immense flavours to which no amount of healthy vegetable oil can replace. This can be prepared very easily and as only the fatty rind will be require so the meat itself can be save for other heathy dishes on days when you decided to redeem yourself for gorging down this delicious guilty-pleasure treats. On this occasion, I had to forgo the see hum as it is almost certainly impossible to find these blood cockles this side of the pond but pork lard, well, it's in there somewhere. So, one out of two ain't bad! To render the pork lard, add the cubed pork fat into a wok over very low heat and allow the fat to render out gradually. Be patient as this will take some time, do not turn up the heat or the rind will burnt. Once all the fat has rendered out and the rind has turn golden brown and crispy, around 12-15 minute. Remove the rind and drain on some kitchen paper. Pour the rendered lard to a dish and set aside. 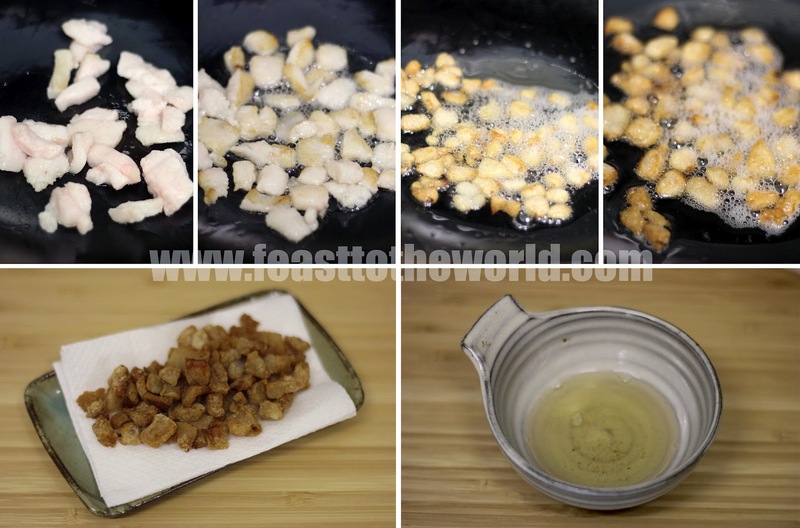 Heat up 3 tbsp pork lard in a wok over high heat until smoking. Add the garlic and stir fry until fragrant, about 30 seconds. 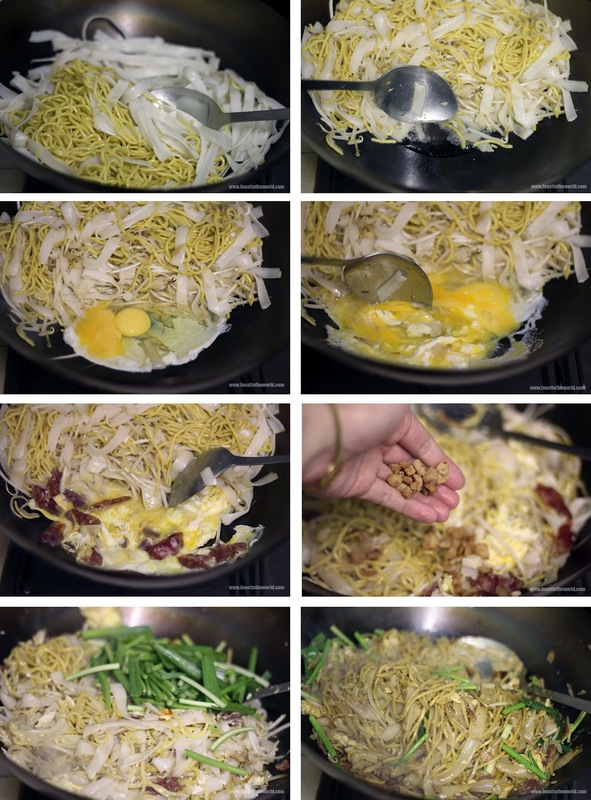 Add the rice and egg noodles and fry for another 2-3 minutes. Add the fish sauce and cook for another 30 seconds before pushing the noodles to one side of the wok. Add 2 tbsp of pork lard and then crack in the eggs. Scramble the eggs slightly before adding in the lap cheung. 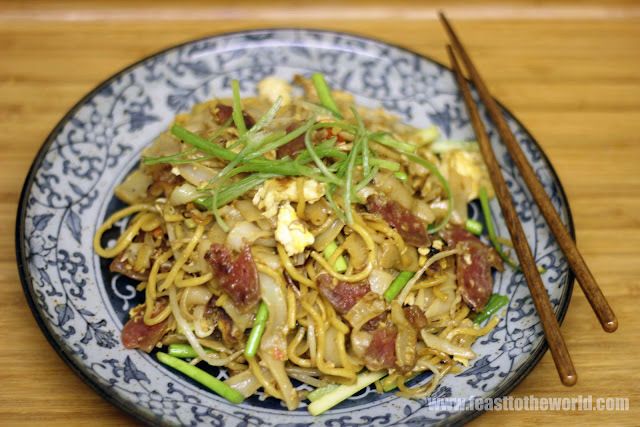 Stir to combine and add the chilli sauce, kecap manis and mix well. Add the bean sprouts, chives and the crispy pork fat, stir to combine and at this point, add the see hum/cockles if using along with some of the juice, mix thoroughly but do not overcooked the cockles. Dish up and serves immediately. So where did you find your cockles? yummyyy. 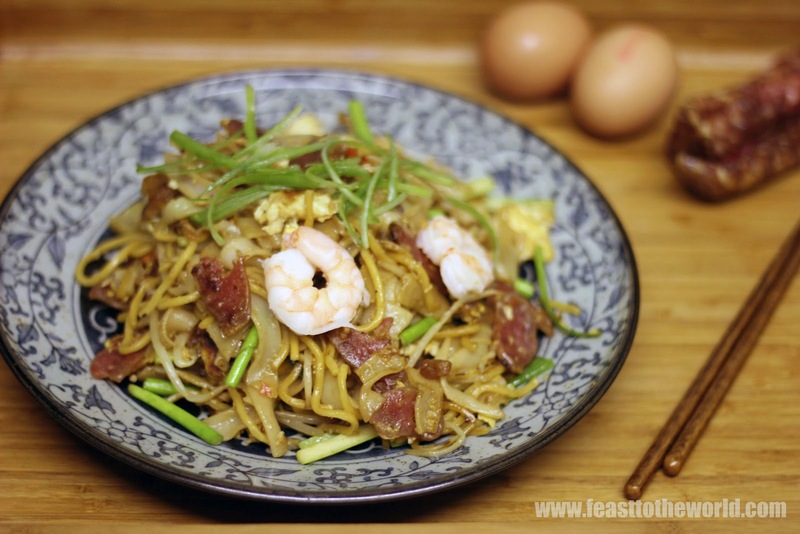 my version is a lot sweeter and darker with more of the kecap manis, but love char way teow either way! shame about the "hum", though I must admit I ask for "mai hum" in sg as I used to be scared of shellfish. and ok won't go into the lap cheong after that twitter spam, but love it without, though will start bugging the ckt aunty for them now haha.